All-Star Orthopaedics, a Dallas and Fort Worth area orthopaedic practice, recently upgraded their website to create a better user experience and a clean, strong foundation. The responsive design and other elite elements serve as an added convenience for patients near and far. 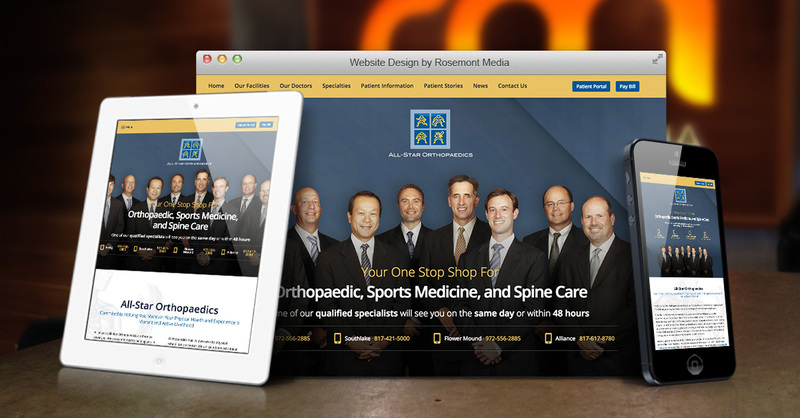 Irving, TX — Dallas sports medicine practice All-Star Orthopaedics overhauled its website with the help of medical marketing firm Rosemont Media, improving the responsive design, expanding the patient reviews section, adding online payments, and more. The result is a streamlined and modern site with an expansive selection of digital tools that are easy to use. Foremost on the minds of the Dallas orthopaedic surgeons was the need for user-friendly features. The patient portal, detailed procedural content, and online payment system offer added convenience for individuals who often lead busy lives. Each element can be accessed from home or while on the go from virtually any Internet-capable device due to the upgraded responsive website design. The full-service practice also boasts on-site physical therapy and X-ray facilities, with the surgeons operating out of local renowned surgery centers. Visitors to the site can learn more about these advanced resources with just a single click of their mouse. As a final boost to the site’s accessibility, leading medical SEO strategies were implemented to help ensure All-Star Orthopaedics lands high on result pages when using major search engines like Google, Bing, and Yahoo. This allows the practice to remain competitive within its marketplace as well as give patients unfettered access when they need it most. With locations in Irving, Southlake, Flower Mound, and Fort Worth, All-Star Orthopaedics is a state-of-the-art sports medicine practice that caters to the diverse needs of children, adolescents, and adults with musculoskeletal injuries and conditions. Every surgeon of the elite team is board-certified and dedicated to providing exceptional care to each patient. The technologically advanced practice emphasizes minimally invasive and conservative techniques designed to reduce recovery time and improve healing, leading to better results for more people.